Let’s face it, food prepping can be pretty scary or seem impossible to do when you’re first starting out on a new diet. But it doesn’t have to be! 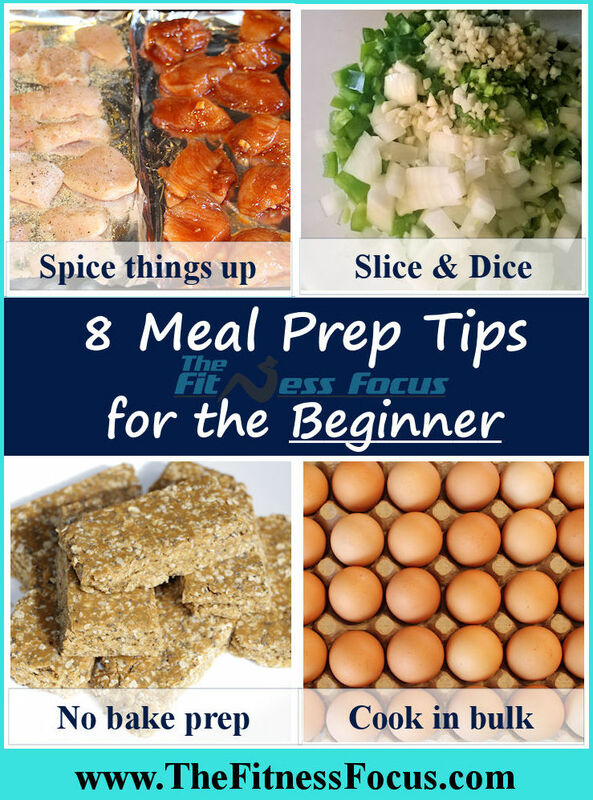 I hear it all the time, “I’d love to be able to food prep, but I don’t know how,” or “I’ve love to be able to food prep, but I just don’t have the time.” But you can meal prep to make your life a whole lot easier in no time…and I’ll share a few ideas here to show you how to get started with meal prep. When you’re beginning any new exercise program, it’s crucial to incorporate the food plan, because honestly you just can’t out-train a bad diet. And one way to make sticking with your eating plan a whole lot easier is to food prep your meals in advance. Food prep is one thing I cannot recommend the importance of enough – especially when you’re first starting to eat healthy. I wrote these tips keeping the absolute beginner in mind. Hopefully it will provide a no stress, quick and easy way to meal prep for a couple hours on one day of the week to provide a few days worth or more of healthy meals. Buying and cooking in bulk will not only save you time, but often money too!!! What Does it Mean to Food or Meal Prep? First, there is no standard way to meal prep. It’s always the way that works best for you, your lifestyle and your schedule. For some, you may make a double dinner and having leftovers for lunch or dinner the following day. When more experienced, you may spend an entire Sunday afternoon preparing breakfasts, lunches, dinners, and snacks for the week ahead. 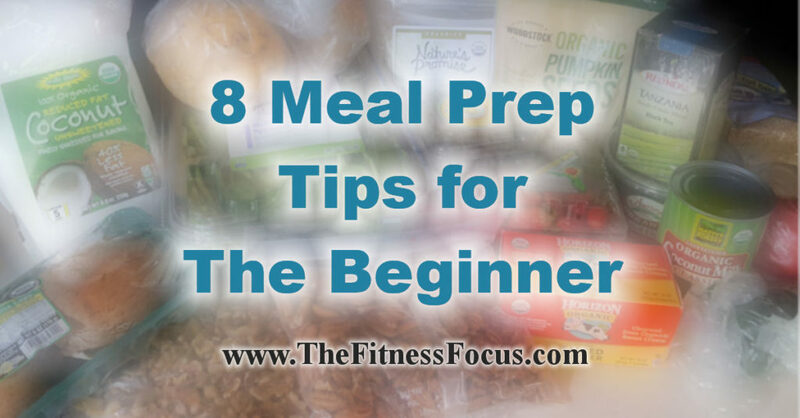 The most important thing to remember here is that you don’t have to overwhelm yourself with prepping an entire week’s worth of food at first(a common mistake). Start by preparing a meal or two for the next day. 1.) Prepare food ahead of time. Even the smallest amount of food prep makes a big impact on you sticking with your healthier lifestyle. Whether it’s having that little bit of extra time during the days when you don’t have any time or knowing that you have a healthy snack to reach for instead of giving in to the urge to splurge, prepping even the smallest amount of food ahead of time makes a huge impact. Think pre-chopping veggies for the next couple days worth of meal and snacks. 2.) Store the prepared food for use in proper containers. It’s not good if you decide to prep your food only to find it looking a bit past its prime by the time you get to it. I like to use these Glasslock microwave, dishwasher, oven, and freezer safe glass Tupperware-like containers for everything, because I know there is always the right size I need and nothing will go bad. Ziploc baggies are also great for separating servings of nuts or your protein shake, as long as you get the ones with the better seals. 3.) Don’t try new recipes. Meal prep for the beginner means sticking to recipes that are healthy, and you have already tried and are happy with the outcome. There will be a time and a place for trying new things, but for the absolute beginner, this can be quick path to failure. Spending a lot of time preparing something you don’t even enjoy can lead to feeling discouraged – and reaching for something unhealthy instead. 4.) There is no right or wrong way to meal prep – it’s the way that works best for you. I cannot stress this one enough, because the way I meal prep may not be the easiest way for you to meal prep. It’s what works best for you and makes your life easiest. Because what foods we like, how we like to eat healthy, how much time we have to prepare, and a whole lot of other factors go into what works best for you. If the only thing you feel like prepping is your salad and separated into servings in a mason jar or hard-boiled eggs, that is absolutely okay. Or maybe it’s about making yourself some roasted chicken made into shredded buffalo chicken, cutting up veggies so you skip grabbing donuts from the break room during mid-afternoon, or putting together the spices or ingredients for slow cooker recipes. Whatever it is, just do what works for you. I know one of my favorite slow cooker recipes that is 100% healthy and gives us several meals is homemade chili. 5.) Changing your eating habits takes time. And learning to meal prep and finding out what works best for you will take more than one week. Don’t overwhelm yourself trying to buy the containers with the areas separated for your food groups or trying to make everything perfect for the week. Start small and build from there, because the longer you work at it, the easier meal prepping gets…just like your workout. Like the 21 Day Fix has helped with making portion control easy, meal prepping makes weight loss even easier. Believe in yourself! You got this!!! The above picture is a little of what I prepped this weekend. From upper left to bottom right. Seasoned chicken – one with salt-free herbs, the other – Sriracha chicken. These will be a nice addition to my salad. Chopped onions, peppers, and garlic – this will be cut in half and used in a creole cabbage recipe(link to on Instagram) and used for another meal that I am not yet decided upon. Homemade no-bake protein bars – a nice little snack for the week ahead packed with protein and healthy fats. Quick cheap, easy, plus I know all the ingredients that were put into them. Recipe is coming soon. Eggs – I will hard-boil about a dozen of these. Great for some added breakfast protein, added to a mixed sald or as a healthy snack. 1.) It’s a huge time saver. You might be thinking how you could save time when you’re still spend the time to prep, but you will save time overall by not having to prepare your lunch in the morning or your entire dinner after a long day. It will make your weekdays much less stressful. Use a day when you have extra time like a Saturday or Sunday morning. Meal prep is supposed to make you feel less stressed – not more. 2.) It will make it easier to stick with your healthy diet. If your healthy food is all prepped and ready to go, you’ll be eating healthier carrot sticks than if you’re in crisis mode with no idea what you’re feeding yourself at the end of a busy day. I also like to keep organic Clif bars as a go-to snack, and I travel with my mini cooler bag, so I have something fresh, delicious and healthy wherever I go, including a spare packet of Shakeology. 3.) It helps makes weight loss easier. Meal prepping will help you lose weight, because you know what meals you’ve planned for the week that make sense with your daily targets that go with your program, and that you won’t stray far from the list if everything you have is right in front of you. Remember that even just the following day’s meals can be prepped – it doesn’t have to be overwhelming or too far out of your reach. Is there something that you struggle with when trying to meal prep? Have a specific question on how to get started? Please leave us a comment below. I am a stay at home momma to two little ones and I cook three FULL meals a day. Every. day. The meals we eat are pretty healthy, but honestly, I just get tired sometimes of prepping and planning and cleaning up, which makes me snack on stupid stuff sometimes! When I was single, I would just eat an easy meal of raw foods. I kind of miss being able to do that. I try to prep and when I do, you are right. It is SO helpful. Whenever you run out of bananas (the original pre-packaged snack) and have no washed fruit or veggies on hand, it’s so much easier to grab your husband’s sugary granola bars and scarf them instead! I struggle with knowing the best way to space the containers between the meals. Where do I use protein, veggies, fruit etc..
Hi Cheryl, You can use them how you would like. If you go to the 21 Day Fix category on the side bar I have a sample meal plan that goes through each meal.